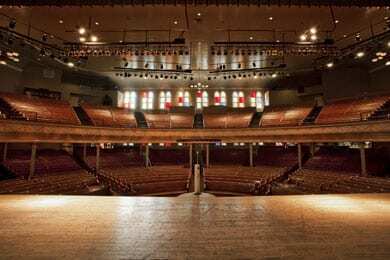 The Ryman Auditorium will be replacing its stage for the first time since 1951. Plans for the new stage include an 18 inch section cut from the existing stage running across the front to honor the historical significance of past performances, similar to the famed circle of the same Ryman stage wood that resides center-stage at the Grand Ole Opry House near the Opryland hotel. Around-the-clock security will be present as the current stage is dismantled and the oak planks are moved to an off-site location. An announcement on future plans for the historic planks will be made at a later date. The last performance on the stage will take place on Friday, Feb. 3 when the Grand Ole Opry closes its annual winter run at the Ryman featuring Keith Urban’s first performance since vocal surgery. The project will close the stage for two weeks beginning Saturday, Feb. 4, but self-guided daytime tours will remain open throughout the project at a $10.00 special rate. The Band Perry will be the first public performance exhibiting the new stage for their sold-out headlining Ryman debut on Feb. 20. “To play the Ryman is to step into country music’s rich history and we are honored to perform there. Now, as the venue makes plans for its future, we promise to inaugurate the new stage with all the respect and reverence it deserves,” said Kimberly, Reid and Neil Perry. The current oak plank stage will be replaced with Brazilian teak certified by the Forest Stewardship Council, the same type of wood used to replace the Grand Ole Opry House stage after the 2010 flood. The size of the stage will remain unchanged at 60.5’ by 36.5’, but new cross-beams and the existing hickory support beams will be bolstered to enhance weight capacity from 40,000 pounds to 120,000 pounds. Installed in 1951, the current stage reflects wear and tear as it hosted the evolution of country and global music including the Grand Ole Opry, the filming of “The Johnny Cash Show,” Roy Acuff, The Carter Family, Dolly Parton, Minnie Pearl, Marty Stuart, Porter Wagoner, Bob Dylan, Aretha Franklin, Paul Simon, Bruce Springsteen, and Neil Young.